Valley Violet ceanothus is a stunning new water-conserving UC Davis Arboretum All-Star selection. The small California native shrub is covered with spectacular clusters of dark-violet flowers in early spring. It is one of the best small ceanothus plants (also called California lilac) for California gardens and performs well in a variety of settings. It can take full sun or part shade, requires very little water once established, develops into an attractive mound that needs no pruning and attracts pollinators and beneficial insects. Valley Violet ceanothus is a stunning water-conserving UC Davis Arboretum All-Star selection that was introduced in 2010. The small California native shrub is covered with spectacular clusters of dark-violet flowers in early spring. 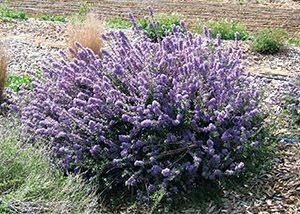 It is one of the best small ceanothus plants (also called California lilac) for California gardens and performs well in a variety of settings. It can take full sun or part shade, requires very little water once established, develops into an attractive mound that needs no pruning and attracts pollinators and beneficial insects. The Arboretum All-Stars are the UC Davis Arboretum’s 100 top recommended picks for the California. These tough, reliable plants have all been tested in the Arboretum, are easy to grow, don’t need a lot of water, have few problems with pests or diseases, and have outstanding qualities in the garden. Many of them are California native plants and support native birds and insects. Before being distributed, the plants are tested in the Arboretum nursery, screened in field trials at Davis, and planted in demonstration gardens by Master Gardens throughout California, to test their tolerance of California's varied climate conditions and performance in low-water use situations. More about the Arboretum All-Stars, including colorful planting plans, an audio slideshow, a searchable database, and a downloadable booklet (updated for 2010) with information on each plant’s features and growing requirements, can be found on the Arboretum website at arboretum.ucdavis.edu—click on Arboretum All-Stars. Ceanothus maritimus (maritime ceanothus) is native to the coastal bluffs and low hills surrounding Arroyo de la Cruz in northern San Luis Obispo County on California's central coast. Attracts bees, butterflies and other beneficial insects.